From left: Stage Light Mono, Natural Light, Studio Light. Taking studio-quality photos used to require a high-end DSLR camera, a trained photographer, and a studio. Not anymore. Thanks to the Portrait Mode and Portrait Lighting features on some iPhone models, you can capture beautiful, dramatic photos using just the phone in your pocket. What Are Portrait Mode and Portrait Lighting, and How Do They Work? Portrait Mode makes the background blurry while the subject of the photo is in focus in the foreground. Portrait Lighting takes Portrait Mode images and applies studio-style lighting effects. All iPhone models that support these features—the iPhone 7 Plus, iPhone 8 Plus, and iPhone X—have two lenses built into the camera on the back of the phone. The first is a telephoto lens that frames the photo's subject. The second, wide-angle lens measures the difference in distance between what’s "seen" through it and what’s "seen" through the telephoto lens. By measuring the distance, the software creates a "depth map." Once the depth is mapped, the phone can blur the background while leaving the foreground in focus to create the Portrait Mode photos. Move within 2-8 feet of the subject of the photo. Swipe the bar along the bottom to Portrait. With Portrait selected, the app will suggest how to capture the best image, such as moving closer or farther away, and turning on the flash. The app should auto-detect a person or a face (if they're in the image). White viewfinder frames appear on the image around them automatically. When the viewfinder frames turn yellow, take the image by tapping the onscreen camera button or clicking the volume down button. You can apply filters to the image before taking it. Tap the three interlocking circles to reveal them. Tap different filters to see how they will look. 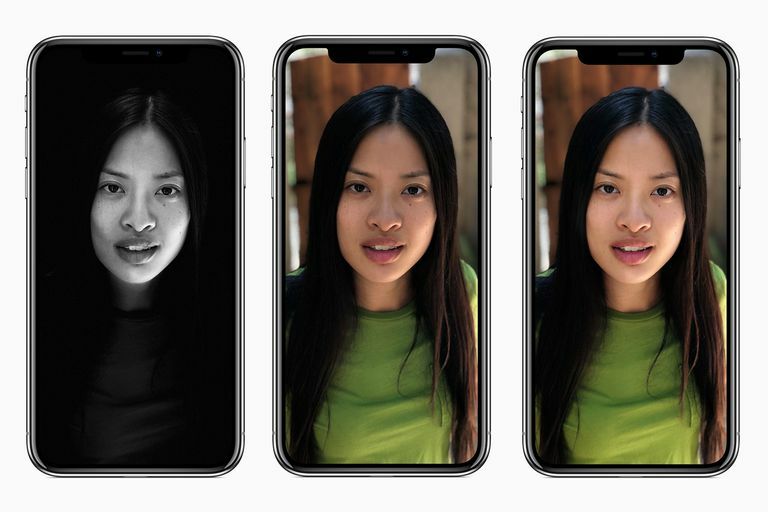 If you've got an iPhone 8 Plus or iPhone X, you can add pro-quality Portrait Lighting effects to your images. All of the steps for taking the photo are the same, except for the lighting options wheel at the bottom of the screen. Natural Light: The default setting. Studio Light: Brightens facial features. Contour Light: Heightens the drama of an image by adding directional light. Stage Light: Puts the subject of the photo in a spotlight. Stage Mono: The same as stage light, but in black and white instead of color. Once you've selected a lighting option, take the photo. You can adjust these effects. Tap the screen so that the viewfinder outline appears, then swipe slowly up and down to move the light slider. The changes appear on the screen in realtime. Switch to user-facing camera (tap the camera button with the two arrows in it). Select Portrait in the bottom bar. Select your preferred lighting option. Click volume down to take the photo (tapping the onscreen button works, too, but volume down is easier and less likely to accidentally get your hand in the photo). Select the photo you want to change by tapping on it. Tap Portrait so that it's no longer yellow to remove the effect. If you change your mind and want to add the Portrait mode back again, just repeat the steps above and make sure Portrait is yellow when you tap it. This is possible because the Photos app uses "non-destructive editing." Swipe the lighting options wheel to select the one you want. Tap Done to save the new photo.